“There are many causes I would die for,” Gandhi once said, “but there is not cause that I am willing to kill for.” In the United States, Martin Luther King used Gandhi’s example to demand better treatment for African-Americans in the Civil Rights Movement of the 1960s. After twenty years of speaking out for the Indian people in South Africa, Gandhi returned to India a national hero. Instead of using his fame to make changes in Indian society, Gandhi spent a year traveling the Indian countryside, dressed only in a loincloth and sandals—the clothing of India’s poorest people. Gandhi began to advocate for the untouchables, a group of Indian people who had faced centuries of discrimination from their fellow Indians. Gandhi called them Harijan, a term that means “children of god." The Harijan, said Gandhi, had been blessed by their suffering. 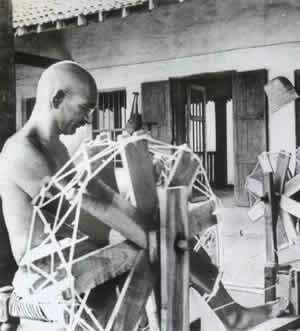 Gandhi devoted two hours every day to spinning yarn, and urged other Indians to follow his example. As a result of Gandhi’s spinning program and the boycott, the sale of British cloth in India dropped sharply. Gandhi devoted two hours every day to spinning yarn, and urged other Indians to follow his example. As a result of Gandhi’s spinning program and the boycott, the sale of British cloth in India dropped sharply. As his popularity in India grew, many people began to call Gandhi the Mahatma, or “great soul." Gandhi and his followers opposed British control of India through civil disobedience and non-violent protest. In 1919, Gandhi organized a strike of Indian workers against the British. Many Indian people sat down in factories or the middle of streets. Women would lie across railroad tracks to stop trains. When British authorities used violence to end the strike, Gandhi cautioned his followers remain peaceful. Gandhi was jailed several times during this period. He told his followers, “We will not strike a blow — but we will receive them. And through our pain we will make them see their injustice . . . because they may torture my body, they may break my bones or even kill me. Then they will then have my dead body, but they will never have my obedience." Gandhi was born a Hindu, but he considered the separation of his homeland one of the greatest disappointments of his life. Some people on both sides blamed him for the fighting. When he was unable to prevent the conflicts by persuasion, he went on a fast. He refused to eat until the fighting ended. Gandhi’s fast stopped rioting in Calcutta and Delhi. A few days after ending his fast on January 30, 1948, a young Hindu fanatic murdered Gandhi as the Mahatma was on his way to a prayer meeting in Delhi. 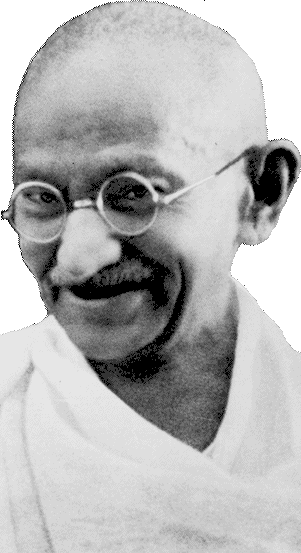 Employing nonviolent civil disobedience, Mohandas Gandhi (1869 – 1948) led India to independence and inspired movements for civil rights and freedom across the world. 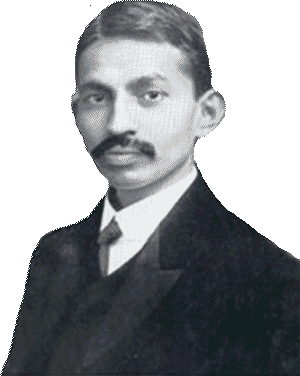 Gandhi photographed as a young lawyer. While studied law in London for three years, Gandhi attempted to become a “perfect English gentleman." He purchased English suits and took violin and dancing lessons until he realized that he was not comfortable with the western lifestyle. Despite Gandhi’s attempt to adopt western customs, he kept a vow to his mother to abstain from meat and alcohol while he was away from home.